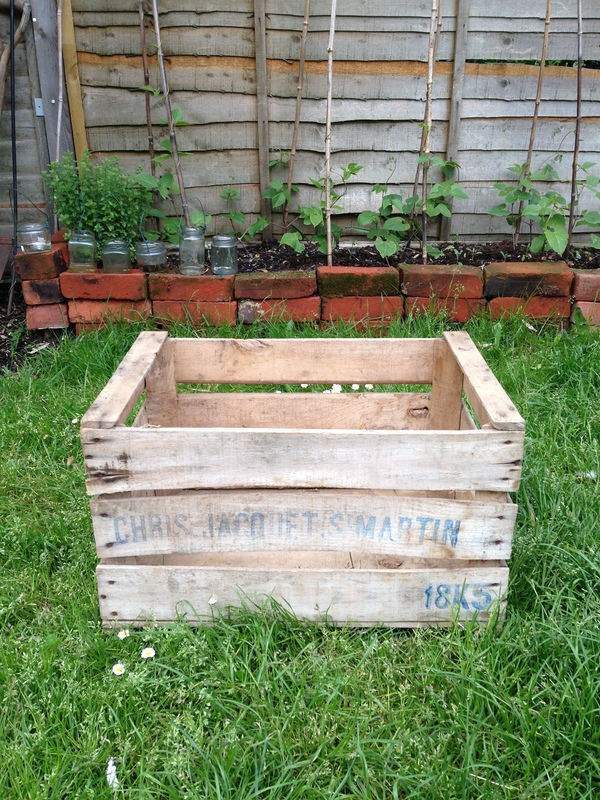 Last year we visited Glastonbury Reclamation yard in Somerset where among a few other bits, I picked up some old wooden crates. We’ve used these vintage bad boys for lots of different things since then including temporary bedside tables, a handy little table when we’ve been camping and even as a cake stand at a recent birthday party. They are very versatile if you use your imagination. A few weekends ago I had a flash of up-cycling inspiration when I was looking through my hundreds of pots for something to plant lettuce seedlings into. 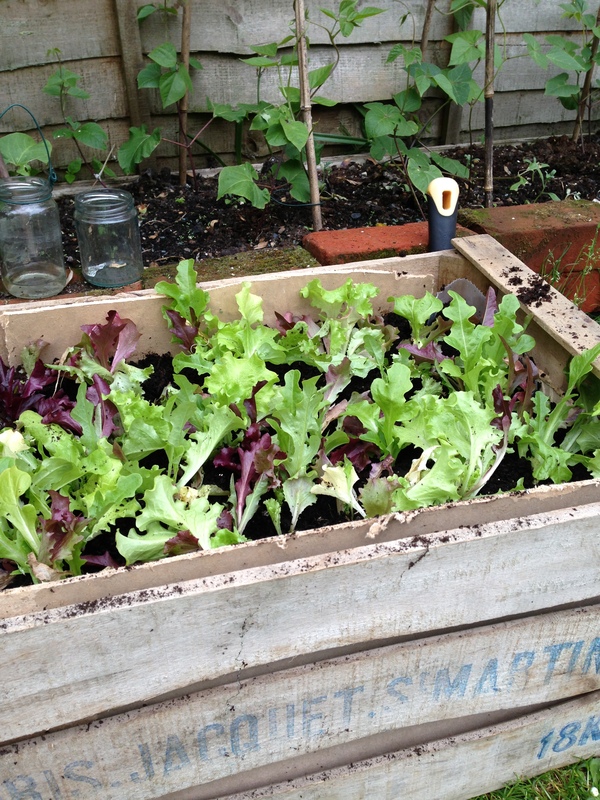 We have some old pallets in the “dump” area of our garden waiting to be made into wall planters but given I needed a strong man for that and he was otherwise engaged, I figured I’d use one of the crates as a rustic looking salad planter. Clean the crate up. In this case I had to remove a few dead spiders. 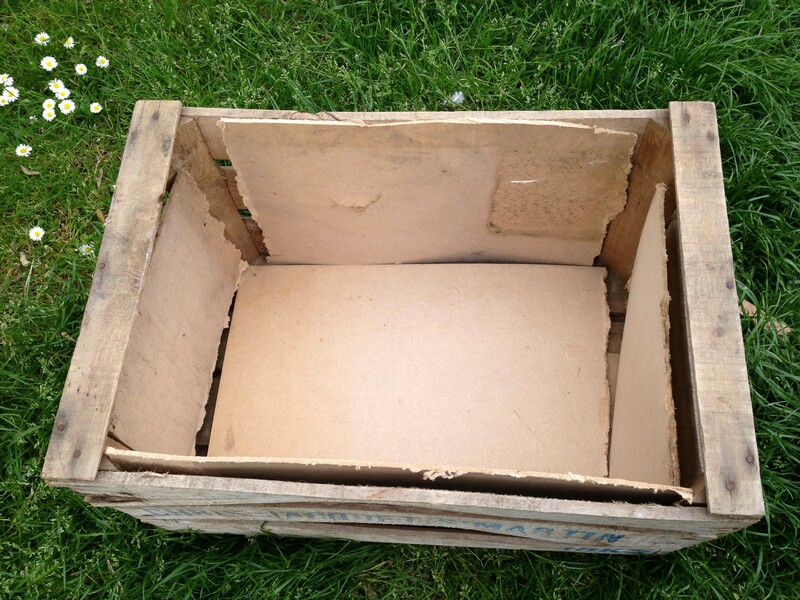 You’ll need to either line the box with something like plywood or a thick plastic bag to prevent the soil falling out. I did both. Just remember to make sure there are holes in the bottom for any excess water to drain away. 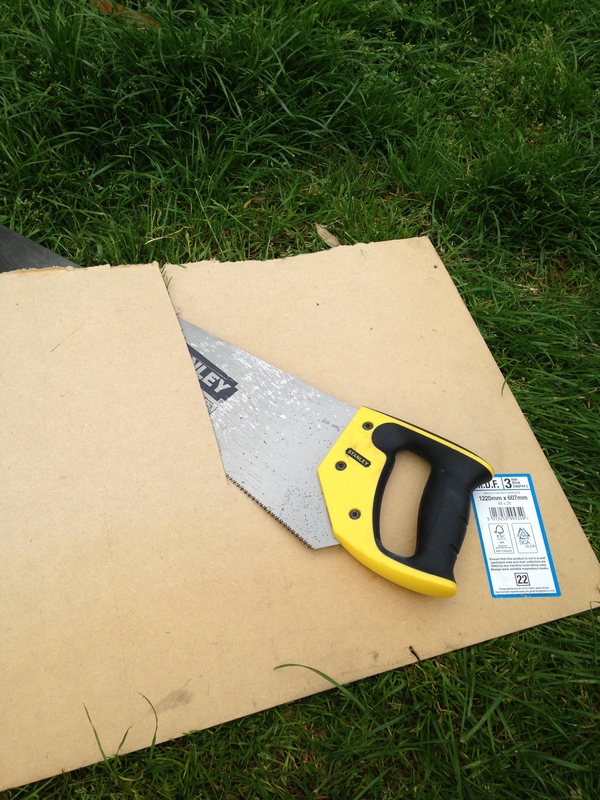 The board doesn’t need to fit perfectly as clearly demonstrated above. 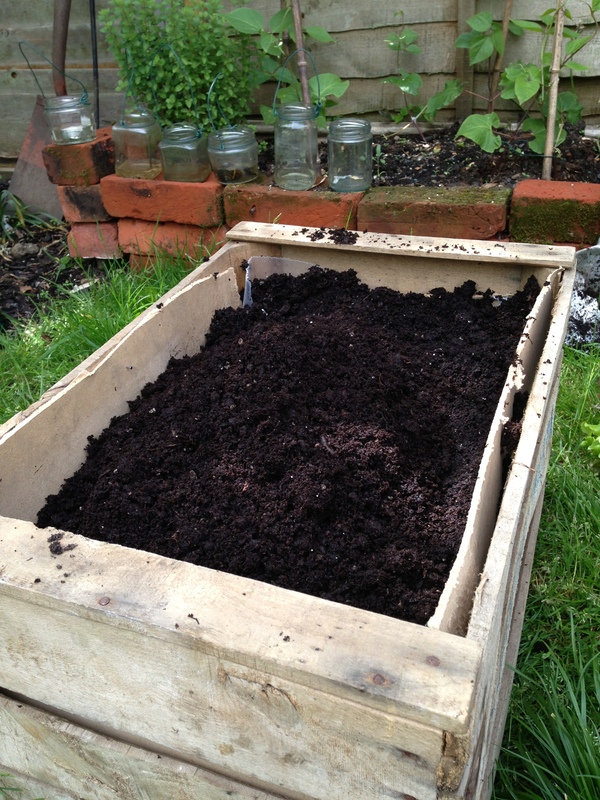 Fill with compost ready to plant your seedlings into it. Top top from me is to site the box before you do this as it’s quite heavy to move afterwards, not advised at 28 weeks pregnant as I found out! Plant the seedlings out and water in. Finally the fun bit. Watch it grow! 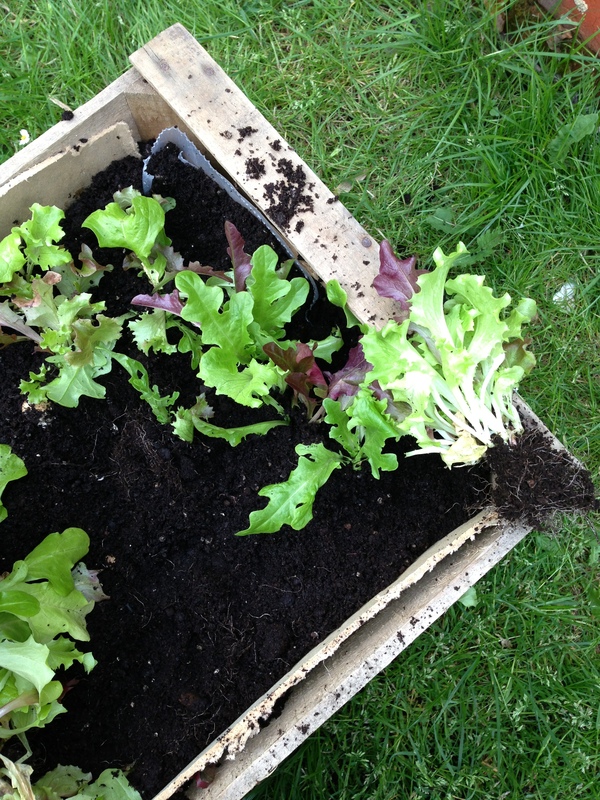 The above was just over 2 weeks ago and it’s now already bursting with delish salad leaves. I like to mix them with edible flowers such as borage, chives and nasturtium for a pretty salad. If you have elderflowers, you could try making an elderflower vinaigrette.